I do not own or know anything about your speakers. That being said, there is two different glass fuses, fast and slow blow types. A blown 2 amp fuse is really a lot of power to those drivers, my guess way too much. A Heathkit/AR AR-3A equivalent speaker system used a 3 amp fast blow fuse, we know of that speakers terrific power handling and output capacity. A speaker such as, Dynaco A-50, used a Dynaco recommended 1 1/2 amp fast blow fuse. This speaker had a more than respectable power handling capacity with that particular size fuse. I would suggest a 1 amp fast blow fuse, until someone else comes along with better advice. Welcome to the CSP Joe! Is that the style fuse you have? The previous owner probably had a defective amp. If your amp is good and has speaker protection built in, you could bypass the fuse (I know Vern is screaming here). It sounds like the previous owner put an oversize fuse in to avoid blowing it, but he ran the risk of blowing the tweeter. Are you sure the tweets are OK? How are the fuse holders? I've read that the Avid holders are pretty breakable. Avids are nice speakers! Congrats! As for the tweeters being damaged... they sound fine to me. my neighbor and I ran some MP3's and vinyl through them the other night and they sounded fine to me. 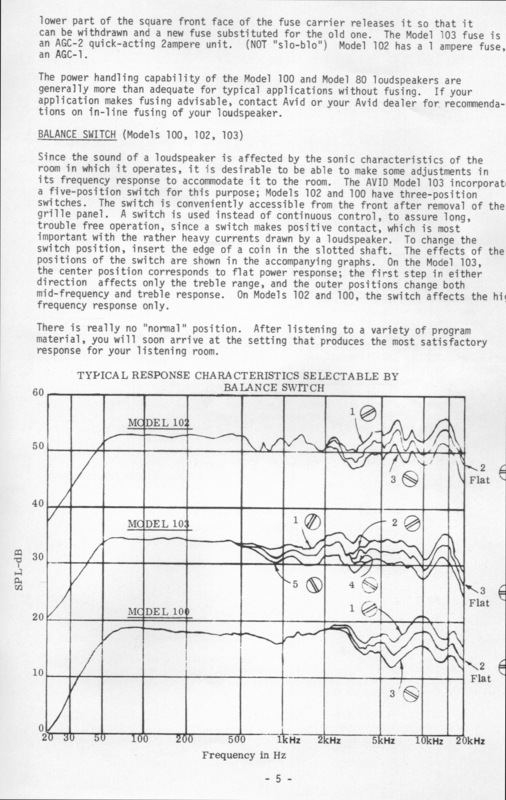 I dont have a trained year, but I think/hope I could recognize distortion if a driver sounded blown I think. Could there have been more subtle damage? Kent, I am not screaming, this is a personnal choice for owners. Over the 45 years I have enjoyed this hobby, I have read and heard many comments, about speaker fusing. Some golden ears can hear the insertion of a fuse, others cannot. Some say the added resistance affects the damping factor, some not. Another type fuse has been used by a few other companies. That is a slow blow FNM/FLM type. This was a commentary only as these do not apply for usage here. There has been a comment that the fast blow does not sound as bad as slow blow fuses, or that implication at least. A speaker fuse that blows is definitely overloaded, thereby protecting either, the entire speaker system or just the tweeter. will blow protecting the $.25 fuse. Some have written that they have never used a speaker fuse and have never had a problem. Some have written that they blew out all 8 or just one tweeter. The AR-LST speaker system uses a 2 amp slow blow fuse where all 8 tweeters have blown, more than one instance. These speakers can handle many hundreds of watts before the fuses blow. They drain nearly all available power amplifiers of their maximum power output, even super amps. With all the members that have written here, I suspect that most do not use a speaker fuse. Some have added fuses to their speaker system since I raised the issue several years ago. The example you have written about shows that a fuse can save one or more drivers, it would appear. I helped a friend buy Larger Advents many years ago, I added an inline open style glass fuseholder and a supply of new 1 amp fuses. Each time I visited him afterwards, I would check to see that the speaker connections were tight. His fuses were wrapped in tin foil in the fuseholder as the fuses had all been blown. Some reports about people placing a penny under an house electrical panel fuse. House electrical fuses had a standard screw-in base size early on and for many years. Finally different size fuse bases were eventually brought out so that they needed a permanent non-removable adaptor, which clawed into the panel. Once this was done, you could never use a larger or smaller fuse than would fit the new size adaptor. That likely ended replacing a 15 amp fuse with a much larger 30 amp fuse. Just so I understand, the fuse is there to protect the mid and high drivers from getting overloaded, yah? So the only problem w/ putting in too small of a fuse would be popping the fuse? As Vern pointed out, an under-size fuse will blow more easily, wasting a fuse. That's what fuses are for. Again, as he pointed out, using a too-big fuse means you are using your tweeters as fuses to protect your valuable fuses! Or, in other words, if you are going to use an oversize fuse (or wrap the fuse in tin foil the way Vern's friend did), you're kidding yourself if you think your speakers are "protected." Better to bypass the fuses. But if you blow a fuse that is the correct amperage, you are either playing at ear-splitting levels or, more likely, you have a defective amp. Read, "other speakers and electronics," section, "fuses for speakers - slow & fast". This is a small and incomplete, but useful thread regarding fusing speakers. This almost everything I had saved regarding different manufacturers recommended fusing information. As more fusing informaton arrives here, it can be added to this topic. I have a pair of Avid 102 Speakers I bought new in 1975. Specification is a 1 amp fuse. Are a nice speaker but the fuse holders are a crap design and the little locking tag snaps off easily. Sounds like you have the square Littlefuse fuseholders. They do have bad press regarding their small tab breaking off. My Dynaco 400 has the same ones since it was built back in the '70's. You need to be gentle removing or inserting the cap. There is usually just the red or white Littlefuse OEM caps on ebuy. Caution when buying, there is copycats, I can't vouch for them. Check out any local ham operator shops or old tv repair shops, they may have just the cap or complete unit. I have a pair of 103's that I purchases new in the 70's. Still using them in fact. When I get home I will check the fuses and let you know. I checked my Avid manual. The 102 uses uses an AGC-1 1 amp fuse and the 103 uses an AGC-2 2 amp. These are both quick blo fuses. I have attached the page of the manual that shows this. thank you very much for posting this. awesome to see the manual! I have 1A (non slow blow) in there for now I am not pushing them too hard and they are holding fine. It is good to know that I can move to 2A if I need to though. Awesome. Avid 103's take 2 amp quick blow (standard) AGC glass fuses. I own a pair. Love those Norelco Dome tweeters.